This vessel is a 26 foot Pro-line with Cuddy Cabin, on board toilet and shower, small galley area with refrigerator, small dining area, live bait well, insulated fish boxes, full tackle and gear, GPS and depth sounder. 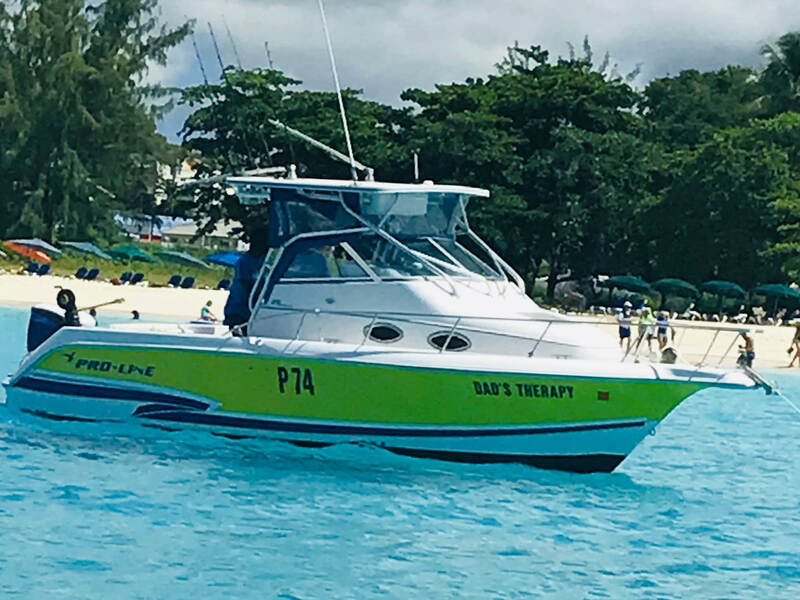 Therapy Charters is a Barbadian owned and operated family fishing charter and pleasure cruise business and guarantees you'll have a great time at sea with them from deep sea fishing charters to swimming with turtle tours. Fishing and fun. Specifically designed for families and friends, this is the perfect way to spend time together. You will fish for Barracuda, Wahoo, Mahi Mahi, Tuna, Marlin and many other species in the Barbados waters. This tour is for all experience levels -- from the beginner to the advance angler. All major fishing techniques used on this trip: Trolling Jigging Live Baiting. We are pleased to offer to our customers the opportunity to feed and swim with the peaceful resident turtles on the south coast of Barbados. Create fun memories as a couple, family or Friends. On this tour the Captain will not only take you to the site but will accompany you in the water and take under water photos. No need to rush, just relax and enjoy. On this tour you and a partner or a small group of friends or family, can reserve the boat exclusively for yourself. You will have a dedicated tour guide that will be with you from Start to finish. Enjoy feeding and Swimming with the Turtles with no hassles or large crowds. Also enjoy snorkeling over the Shipwrecks and swimming with the beautiful resident fish. Families are welcome with small children 3 months and older - we will accommodate your special needs so you can take a break and enjoy the moment, you deserve it. Drinks and snacks are included... All equipment provided. This tour caters to Mothers with young children who wish to have a refreshing break while still in the company of their young ones ages 3month and up. Children under 12 years free. Contact us for more details. 55 USD per pax for 2 hours, flexible departure time. Price/ boat 1-8 person max. Fishing on the south or west coast of the island. Great experience for the novice/ beginner angler. On this trip you will fish primarily for Barracuda, Jacks, Grouper and other species of fish. Fishing and fun. Specifically designed for families and friends, this is the perfect way to spend time together. Fishing the fun and easy way in Barbados. You will fish for Barracuda, Wahoo, Mahi Mahi, Tuna, Marlin and many other species in the Barbados waters. This tour is for all experience levels -- from the beginner to the advance angler. All major fishing techniques used on this trip: Trolling Jigging Live Baiting.